Ride the rails this School Holidays! 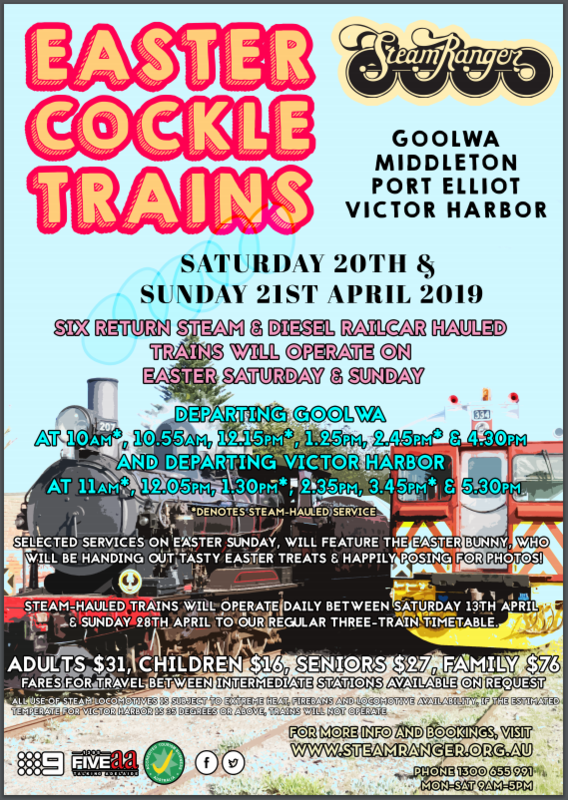 The steam-hauled Cockle Train will be operating daily between Goolwa, Middleton, Port Elliot and Victor Harbor from Saturday April 13th* to Sunday 28th Inclusive. The Easter Bunny will ride the Cockle Train handing out tasty chocolate treats on Easter Sunday, with special thanks to our generous sponsors Bendigo Bank, Woolworths (Victor Harbor) and Foodland Goolwa. Tickets for Cockle Train services are available on the day from Goolwa, Port Elliot and Victor Harbor Stations. If you are staying at Middleton, don’t forget to hail the train! Not content with staying on the South Coast? Why not head for the hills? The Finniss Flyer will head northward from Goolwa on Wednesday 24th April, while the Southern Hills Special will meander its way from Victor Harbor to Mt Barker on Saturday April 13th. From Mt Barker, the Highlander will travel to Strathalbyn on Thursdays 18th and 25th April. Bookings for these services are highly recommended, by calling 1300 655 991.